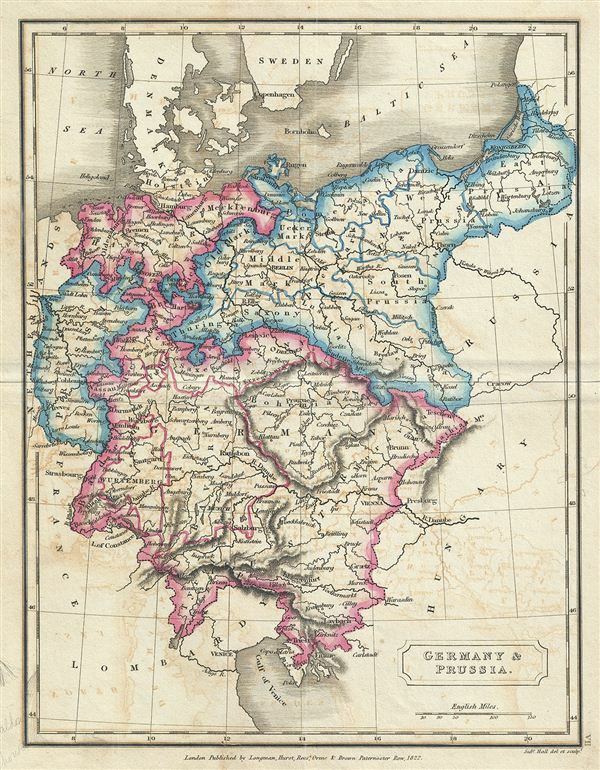 This is a fine example of Samuel Butler's 1822 map of Germany and Prussia. It covers from Holstein and the Baltic Sea south as far as the Gulf of Venice, including the modern day countries of Germany, with parts of Poland, Czech Republic, Austria, Italy and Lithuania. After the defeat of Napoleon, the Congress of Vienna created The German Confederation to coordinate the economies of these separate but culturally related German-speaking countries. The Confederation acted as a buffer zone between Austria and Prussia, the two largest and most powerful member states. Nonetheless the rivalry between the two powerful states increased until it finally broke out into the Austro-Prussian War. Prussia won the Austro-Prussian War in 1866 which ultimately led to the collapse of the German Confederation. A few years later, in 1871, most of the former Confederation states were folded into the newly proclaimed German empire. The map is somewhat detailed with regional boundaries outlined in color. Various towns, cities, rivers, and several other topographical features are noted with relief shown by hachure. This map was engraved by Sidney Hall and published by Longman, Hurst, Rees, Orme & Brown for issue as plate no. VII in the 1822 edition of Samuel Butler's An Atlas of Modern Geography.